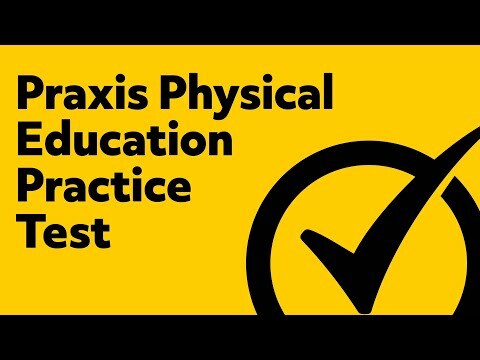 This information is designed to help you get ready to take The Praxis® Physical Education Content Knowledge (5091) exam. Through this article, you get an idea of what you’ll be assessed on, plus other things you can do to prepare for a successful test. The Praxis exam assesses your professional aptitude as a prospective physical education teacher for elementary through high school levels. In general, those who sit for the test are in the process of completing, or have already completed, their bachelor’s degree in physical education, exercise science or some other, similar area of study. The Praxis exam ensures that those taking the test have the competencies and knowledge needed as a beginning-level physical education instructor. Prerequisite requirements before taking the Praxis test are different, depending on individual state or agency. You can learn which prerequisites you’ll need to fulfill before registering for the test by visiting www.ets.org/praxis/states. Prior to arriving for your test, be sure to register online at www.ets.org/praxis. The cost to take the Praxis exam is $120 and is due when you make your application. You can pay via American Express®, MasterCard®, VISA®, Discover®, JCB®, money order, U.S. Postal Service money order, bank check in U.S. dollars from a U.S. bank, PayPalTM, or eCheck. When you register online for your test, you’ll learn the time and location of your exam. You’ll have up to two hours to complete your exam. A form of Identification, showing your name, signature and photo (including IDs such as a passport, a driver’s license, state/province ID, national ID or military ID). An approved calculator if one is needed or required for your specific exam. While some test location may have a locker available for you to store valuables and other items not allowed during the exam period, please make arrangements to bring only those items allowed or needed during your test. The Praxis test is delivered via computer and is made up of 120 selected-response questions. Here’s an overview of the four categories of content that you’ll be tested on during the Praxis exam, along with the relative weight each category will have as part of the overall exam. Includes core concepts, such as terminology, basic science applications, principles of biomechanics, concepts in movement, physiology, anatomy, trends, movement strategies, liability and legal aspects, developmentally appropriate learning, individual performance monitoring, development readiness, motor develop perception, and use of appropriate support services. Covers concepts such as classroom management, psychological and social factors, organization, motivation, positive relationships, effective behavior management, verbal and nonverbal communications, instructional feedback, communicating learning objectives to students in multiple ways and communicating with respect and consideration. Teaching skilled movement, activity and fitness in a number of ways, sequencing motor skill activities, using feedback to enhance skill development, improving health and skills, trends, developing and implementing instructional goals, developing unit and lesson plans, learning strategies, teaching resources, effectively demonstrating activities, safety, injury prevention, skill performance assessment, and assessing student learning. Includes educational issues that affect multiple subject matter areas, integrating diverse skills, establishing relationships to support student growth, promoting activity in school and the community, reflection techniques to enhance teacher performance and student learning, capitalizing on available resources and the use of technology to aid overall goals. Each association, institution and state set their own passing score thresholds. To learn the passing score in your area for the Praxis exam, please visit www.ets.org/praxis/states. Mometrix Academy is a completely free resource provided by Mometrix Test Preparation. 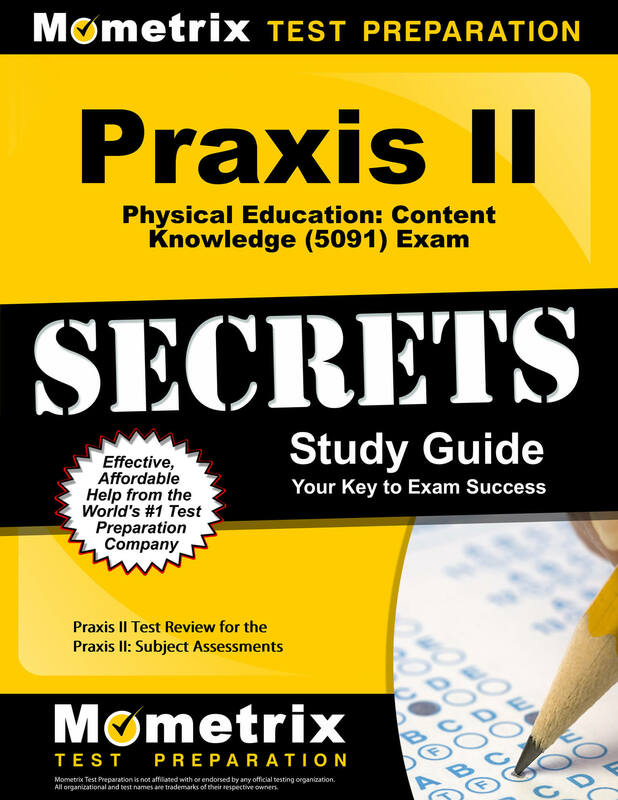 If you find benefit from our efforts here, check out our premium quality Praxis II Physical Education: Content Knowledge (5091) study guide to take your studying to the next level. 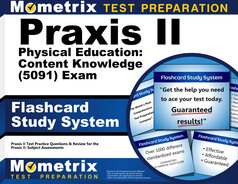 Just click the Praxis II Physical Education: Content Knowledge (5091) study guide link below. Your purchase also helps us make even more great, free content for test-takers.